If one was to have made a strategic decision at the start of 2015 to invest in property, from a capital growth perspective, the median house price has increased slightly more in Sydney (43.1 per cent) than Melbourne (41 per cent) over the 3 years ending December 2017. With a 37.7 per cent increase in median house prices thus far, metropolitan-Hobart, where Propertyology began investing in mid-2014, is sitting very close on the shoulder of Sydney and Melbourne. One could have purchased 3.5 houses in Hobart for the price of one in Sydney in January 2015. As the race for this hypothetical investor continues to unfold, it’s now abundantly clear that Hobart is about to hit the lead. And not be a smidge either; it’s about to fly right past.While Sydney and Melbourne both started the 2018 calendar years with consecutive monthly price declines, data suggests that Hobart’s property market is further accelerating from the 12.3 per cent price growth in 2017. The economy in all three capital cities looks like remaining strong for the foreseeable future. But, whereas motivated buyers who can still afford to buy in Sydney and Melbourne are now few and far between and large volumes of new supply keeps hitting the market, Hobart’s biggest challenge is insufficient stock for sale which is adding even more pressure on prices. With Sydney and Melbourne’s bull run now officially over and the knowledge that there’s typically 6 to 12 years between growth cycles, investors might be wise to start to think about whether now is a good time to sell and recycle their profits in to other markets. 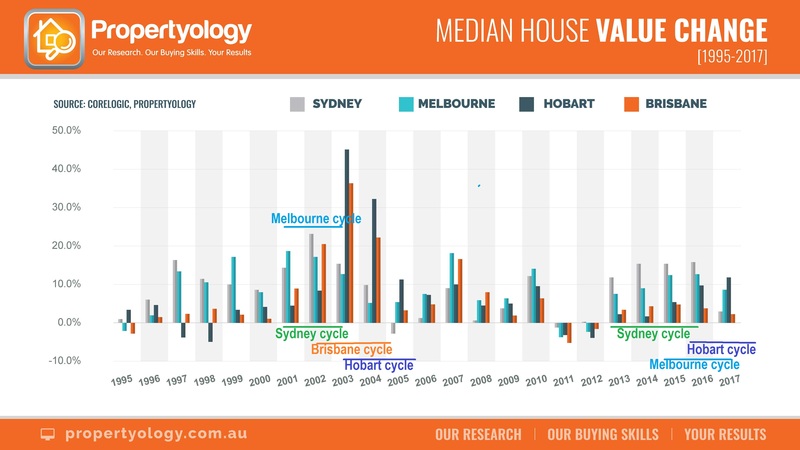 The annual holding cost on a median value house in Australia’s two most expensive cities were digestible when the asset value was roaring ahead. But the tide has well and truly turned. Back-of-the-beer-coaster calculations which take in to account the initial purchase price in January 2015, current median rents, loan interest costs at 4.5 per cent, and other standard property costs, illustrate that the hip pocket is being hit very hard. A house purchased at the beginning of 2015 in Sydney for the median value of $1,147,433 will today set the owner back $21,440 per year, assuming they initially borrowed 80 per cent of the purchase price. The same scenario in Melbourne equates to an annual holding cost of $10,837. That’s significant coin to continue to outlay while waiting umpteen years until the next growth cycle comes along. And those investors who leveraged against the equity in their family home to purchase an investment property, effectively borrowing 105 per cent (including acquisition costs like stamp duty), will need to find $34,000 per year in Sydney or $18,000 in Melbourne. That same fully leveraged house in Hobart will today only cost the owner $1,800 per year; it would be cash flow positive to the tune of $1,800 if the hypothetical owner made the purchase using a 20 per cent deposit.And the capital growth just keeps coming! If ever there was a chance of a capital city breaking Darwin’s record as the last Australian capital city to exceed 20 per cent price growth in a calendar year (22 per cent in 2007) it is Hobart, especially in the municipalities of metro-Hobart, Clarence and Glenorchy. As Australia’s only property market analyst to pick Hobart’s remarkable transformation, I’m increasingly asked the question ‘when will Hobart’s growth cycle end?’ The answer is ‘no time soon’. No growth cycle runs forever however, all of the metrics which shape one’s opinion point towards further growth in Hobart – lots of it! Canberra (20.5 per cent), Adelaide (13.6 per cent) and Brisbane (12 per cent) have seen much more sedate growth over the last 3 calendar years. The median house price in Australia’s fourth largest city, PerthPerth, TAS Perth, WA, and Darwin is lower now than 3 years ago. If we were to describe the current performance of Australia’s 8 capital cities as a horse race, Hobart is Phar Lap and it’s up against 7 donkeys! If you’d like to know more about Propertyology’s services, here’s how you contact them. Propertyology is a national property market researcher and buyer’s agency, helping everyday people to invest in strategically-chosen locations all over Australia. The multi-award-winning firm’s success includes being a finalist in the 2017 Telstra Business Awards and 2018 winner of Buyer’s Agency of the Year in REIQ Awards For Excellence.